Animal Cultures – on the road again! It’s easy to think of human culture as uniquely isolating us from nature and basic evolutionary processes. Our research has instead revealed cultural processes of varying complexity in primates, birds and fish. The exhibit is now at the Budongo Trail in Edinburgh Zoo as part of the Edinburgh International Science Festival and will be there, with volunteers available to answer questions about research studying ‘cultural’ behaviours in several different species. It will be at the Zoo until Sunday April 19th. Luke Rendell from the School of Biology, along with collaborator Hal Whitehead of Dalhousie University in Canada, has a new book released this month by University of Chicago Press, titled “The Cultural Lives of Whales and Dolphins”. Author Phillip Hoare describes it as “an astonishing, unconstrained exploration of the nature and practice of cetacean culture. The When in Rome… touch screen interactive about Erica van de Waal’s research into the behaviour of vervet monkeys is now available online (a fast internet connection is advised). You can also see a video which is which is part of this interactive here. A new page has been added to the site with a large gallery of images of visitors to the Animal Cultures stand at BBSRC GBBF. 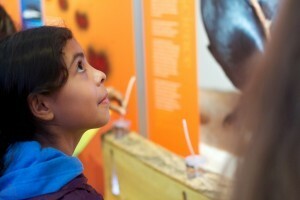 The videos and loops used in the Animal Cultures video exhibit are now available online. Behavioural tradition has been an active topic in animal behaviour since the renowned Japanese macaque studies of half a century ago, yet controlled field experiments to clearly identify social learning in the wild began only recently. This talk describes a series of social learning experiments with our population of vervet monkeys in South Africa, which have now been studied for seven years. We follow over a hundred monkeys in several neighbouring groups. Just added Alaina Macri’s great worksheet pdfs to our resources page. Researchers, including Dr Catherine Hobaiter from the University of St Andrews, have observed the spread of a new tool being invented and used by a group of wild chimpanzees. This is the first time that researchers have been able to track the spread of a natural behaviour from individual to individual in the wild. Whilst watching chimpanzees in the Sonso community in the Budongo Forest extracting water from a hole in the forest, the researchers noticed two things that they had never seen before in that group – the use of moss to form sponges and the reuse of leaf sponges. Chimpanzees in the Sonso community regularly form bundles of leaves to soak up water, but the use of moss was novel. By using a statistical technique called network-based diffusion analysis the researchers were able to track the spread of the behaviour from the alpha male who first used it, to other individuals who had been watching him. The study is published in PLOS Biology and can be found online here. There will be more information about chimpanzee cultures and how we can trace the spread of new behaviours using social networks on the Animal Cultures stand in November. 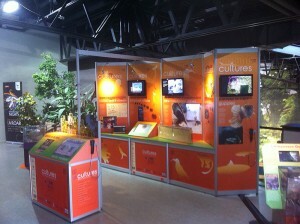 This week we are at Edinburgh Zoo with our Animal Cultures exhibit. Sited in the Budongo Trail, you will be able see Edinburgh’s resident chimpanzees (including the two-month old baby) in their state-of-the-art home while you have go at a chimp puzzle. Will you be as good as a chimp at learning how to find the hidden food? The stand explains how researchers from Scotland and further afield have used a combination of thousands of hours of observations, advanced gadgetry and fun experiments to work out how animals, from guppies to capuchins monkeys, learn from one another and form traditions. You can try your hand at recording the behaviour of wild vervet monkeys, attempt to hook out some delicious grubs using crow tools and see how meerkats teach their young to catch deadly scorpions. The stand will be in the lecture theatre at the Budongo Trail from 10.00 to 16.00 until Sunday 28 September. Each day researchers from the projects featured in the exhibit will be on hand to explain what they do and answer your questions.